Two people have been killed in a shooting at US Naval Station Norfolk, Virginia, one of them a sailor, and another a civilian. The base was briefly put on lockdown, but it was lifted afterwards. A civilian entered the grounds of the naval base late Monday, disarmed a petty officer on watch and fatally shot a sailor at about 11:20pm (04:20 GMT Tuesday), base spokeswoman Terri Davis said. Navy security forces then killed the offender. Davis said she was not sure whether the suspect was authorized to enter the base. The base was briefly on lockdown, but the area is currently secure, Davis said. Officials will release both men's names once their families are notified. The sailor was an active-duty serviceman, and Navy officials were looking into the "access and credentials" of the civilian, who was suspected of shooting the sailor, Navy spokeswoman Beth Baker told Reuters. "We'll find out what happened, and we'll prevent that from occurring again," Admiral Bill Gortney, commander of US Fleet Forces Command, based in Norfolk, told the sailors, who gathered for a moment of silence for their colleague on Tuesday. 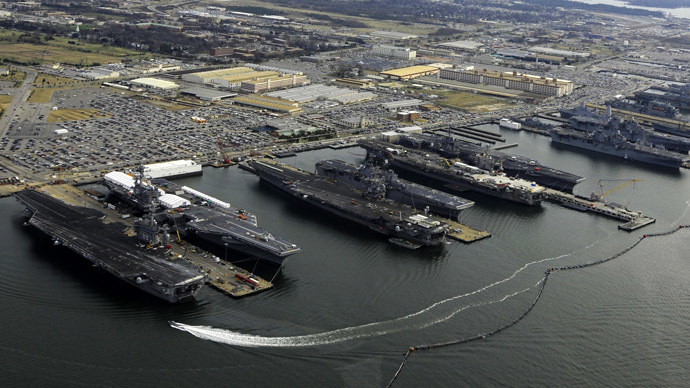 Naval Station Norfolk is the largest naval base in the world, and supports the US Naval Fleet for the Mediterranean, Atlantic and Indian oceans. The station supports at least 75 ships and 134 aircraft, according to Military.com.